The application allows you to streamline your business communication through complete automation of messaging to your partners and customers. After easy configuration the Event Manager is able to analyze your changing databases according to the conditions you set, and send SMS messages to designated mobile phones all over the world via Internet directly from your PC. 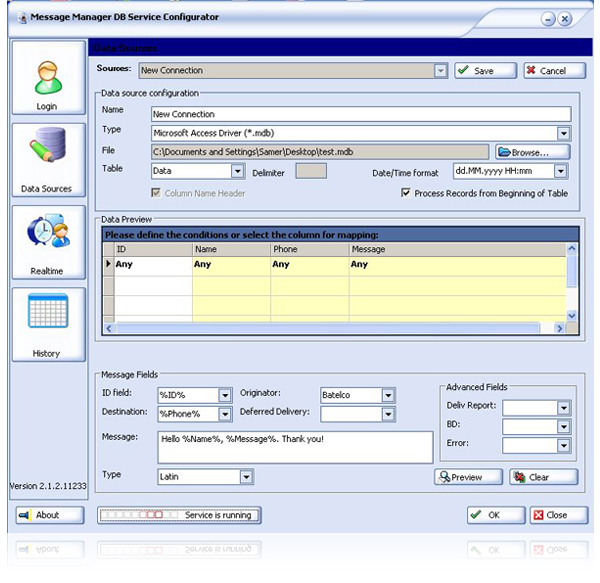 The message texts are configurable and can automatically change according to the business events reflected in the databases. After the proper configuration the Event Manager runs as a standard Windows service. As a business solution, the Event Manager application gives your customers and employees practically immediate feedback on business-critical events, while considerably reducing the operation costs. The Event Manager is able to keep an eye on the situation in the 24/7/365 mode. Alternatively, you can configure it to so that, for example, evenings and weekends can be free from the business notifications. • Monitor one or several business data sources. • Use practically any major type of databases. • Customize the texts to send using the databases records. • Schedule the messaging time and days. • Use proxy connection if necessary. • Send messages in English, French, or Arabic with Arabic or Latin numbers. • Control queries, retries, and message status checks to optimally balance your server load. • Watch the Event Manager operating real-time. • Check the messages sent. • Select the interface language to be Arabic, English, or French.